New startup Whyd, which launches publicly today, wants to help you rethink how you find and consume online music. The platform is inherently focused on social music discovery, and just so happens to do so while also circumventing the need to spend any of its own money on music licensing. Almost every track that you can think of is already accessible via the Internet. Databases of music like Pandora and Spotify typically require subscriptions and still require users to be connected to the Internet to access their playlists and find new music. But since we’re already listening to music online and the music is available for free, Whyd is tapping into the many different free sources out there. The five person company, based out of Paris and co-founded by CEO Giles Poupardin, and CTO Jie Meng-Gerard, is aggregating readily accessible music from around the Web into a minimalistic, easy-to-use playlist. Through an in-app search engine that embeds music from sites including YouTube, Vimeo, Soundcloud, HypeMachine, and MP3 blogs, users can search for tunes and add them to Whyd’s customizable playlists. Users also aren’t limited to searching for music on the aforementioned sites. If you find a particular song on a site that’s embedded or hosted (for instance, if you see a friend posted a track to Facebook), you can use Whyd’s browser bookmarklet to add these songs to your playlist. The listening experience mimics any music site that plays downloaded MP3s, no surprises here. In using the app, you’ll be please to find no skips and hesitations in between songs even if your playlist is playing a track from Soundcloud after a YouTube music video — there’s no lull even though there’s a platform transition. The media isn’t hosted on Whyd, Hymes explains, so it’s fast and plays across platforms without interruptions. Based on our experience with Whyd, the app could one day compete with Last.fm, Spotify, and other major music sites, especially since it gives users a way to avoid monthly subscription fees many other services require. But the one caveat to relying completely on third-party sites is that Whyd will inevitably need to comply with DMCA requests should copyrighted content surface (which it inevitably will), meaning you’ll lose access to that content and your playlist will be a bit emptier. Of course like most music sites, there’s a social component to the app. One of the attributes that’s unique about Whyd is that every playlist on the platform is public. A visitor isn’t required to sign up to listen to a user’s playlist, so anyone can access any song on a Whyd profile page. The second attribute is the ability to subscribe to other users, but on Whyd we would recommend being selective about who you follow. The tracks shared by the user you’ve subscribed to are automatically shared onto your own stream – essentially a news feed updated with music. This means that because both the playlist and stream are publicly viewable, you’re representing the musical taste of users you’ve subscribed to. “Being music lovers, we also wanted a more automatic way to personalize music discovery, so we combined the idea of adding tracks with sharing them at the same time. Chances are, if you post a few songs I like, I will like a lot of your music. And you might provide some new angles to music that I never would’ve considered if I had tried to search for people to follow using generic tags. 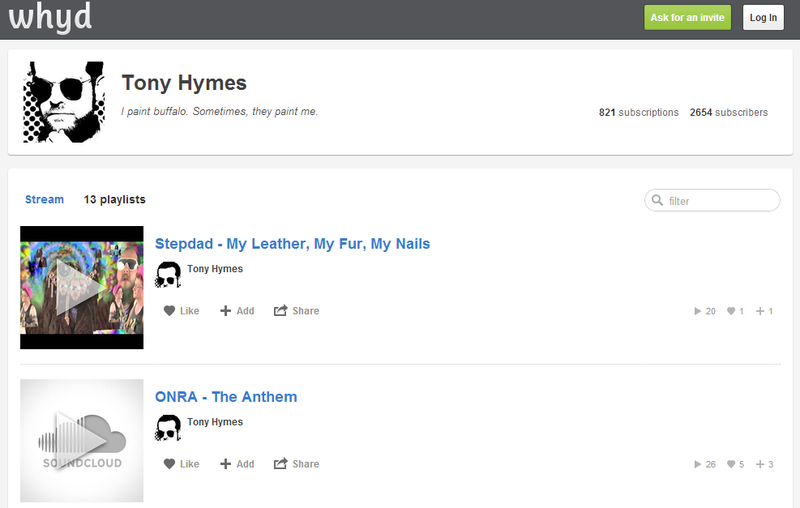 The idea is to interact with other music lovers via the music, check out their pages to see what they post, and subscribe,” says Hymes. But before it can be a strong contender to leading music sites, Whyd in its current form, lacks more robust services like preset playlists, curated lists of new releases or chart-topping tracks which users typically are paying for, and of course professional-grade sound quality. Audiophiles should know that user-generated content on YouTube and SoundCloud aren’t the most reliable sources for premiere sound quality. Then there’s the fact that Whyd’s search engine isn’t particularly thorough nor accurate with finding every single track. There are also some inherent problems with Whyd’s business model. While the purpose of the site is to surface lesser-known, even archaic music, it can cut artists out of the picture if users are listening to tracks hosted on SoundCloud or Vimeo, for example. These sites, unlike YouTube, don’t offer advertising revenue or a cut from online stream, and the music industry might not take kindly to this new strategy even if it is aggregated from publicly available sources. Whyd, on the other hand, sees it differently. “We also must remember that artists have provided some of their music for free online, that when people listen to it, it should be shared with others, in a way helping build awareness and finding new fans,” says Hymes. The team is working on building a mobile app and is working on adding support for other music platforms, like BandCamp.